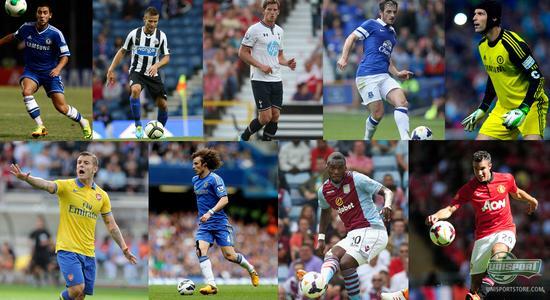 The start of the Premier League is tomorrow! The wait has been grueling, but right now, all the worlds biggest stars are putting the finishing touches on their pre-season preparations, before they storm onto the pitch on Saturday. 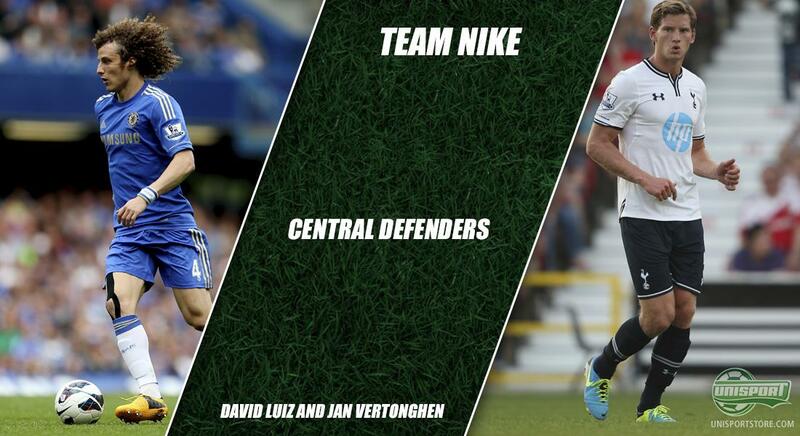 We have had a little fun and made two squads of the very best players in the Premier League from Nike and Adidas. We have then put them against each other, but who do you think wins? 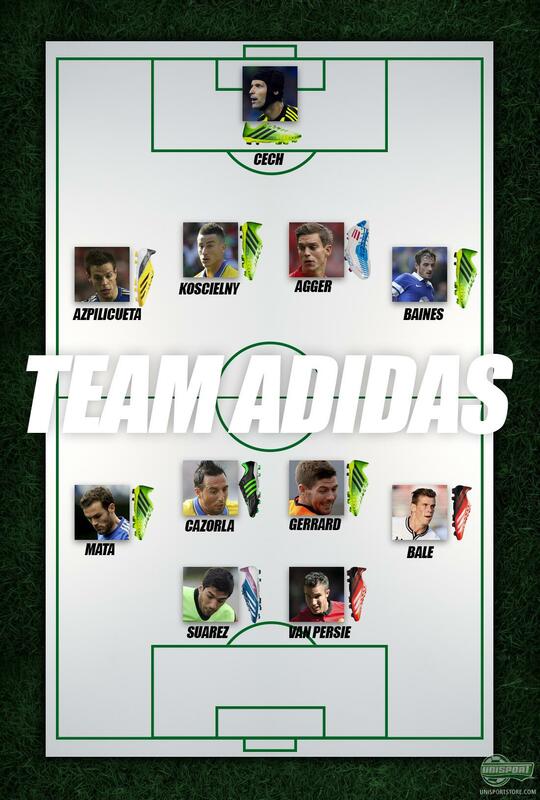 What if the teams weren't called Manchester United, Chelsea and Arsenal, but instead Team Nike and Team Adidas? 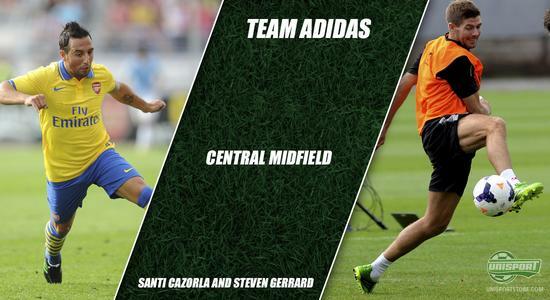 We have played around with the idea a bit and comprised two teams of Nike-athletes and Adidas-athletes. Even though the game will, regrettably, be fictitious, it is still an interesting duel. However should Nike and Adidas happen to be reading this, then we would be big fans of them staging an event like this, as long as we are of course invited. First of all we would like to say what a great honour it is, to be appointed manager of Adidas and Nike's Premier League All Star team (In our little imaginary world we can manage both). We promise to do our very best to live up to the faith that has been shown in us, as we take on the tough challenge that is picking a starting 11 among the many stars. 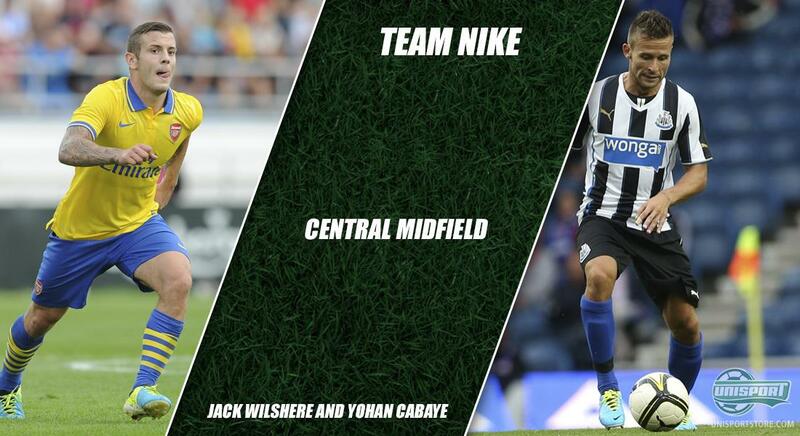 Team Nike is fit for fight! 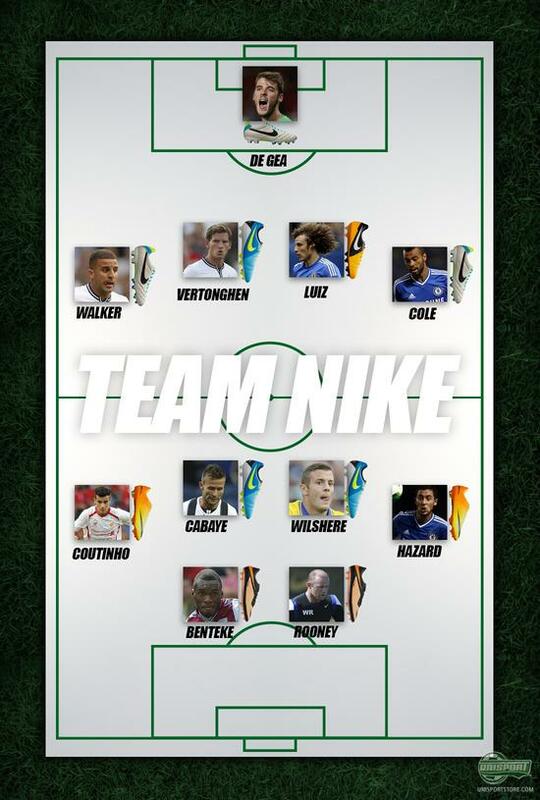 We have, after discussing many names, finally established what our starting 11 would look like, when making a Premier League side of Nike-athletes. 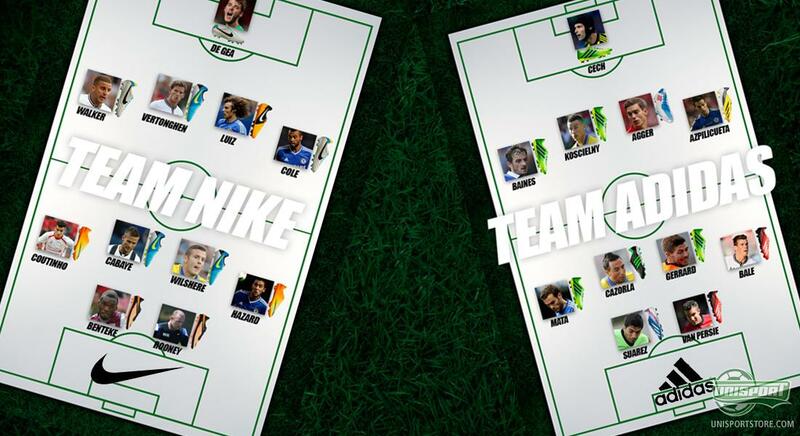 There is no doubt that this is an incredibly strong side and as manager of Team Nike we expect to see direct and attacking football, mixed with powerful defending. This is actually not something we expect to see, this is something we demand they do. In goal we have picked David De Gea. He struggled to begin with in the United shirt, but has proven his sturdy nature and grown into an absolute class keeper. Wearing his Nike Tiempo Legend IV and Nike Vapor Grib 3, he has managed to fill the gap left by Edwin van Der Sar in impressive fashion. 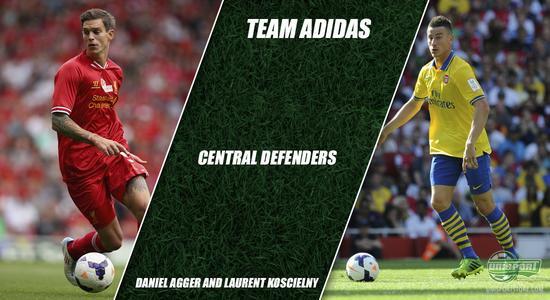 In the central defense we have gone for a great mixture of physical prowess and technical ability. In the heart of defense we see an Vertonghen and David Luiz, who are both assertive defnders, yet technically gifted players too. They both wear the Nike CTR360 Maestri III to great effect and we expect to plenty of driving runs forward, as well as intelligent defending, to keep the opposition at bay. The full-back position was a tricky one, because we wanted both flair and defensive ability. We picked Kyle Walker from Tottenham at right back, who the last couple of seasons, has proven himself at the very highest level. Wearing Nike Tiempo Legend IV he has shown defending without compromise and scintillating attacking play. He is joined by the seasoned Chelsea left-back, Ashley Cole, who needs no introduction. 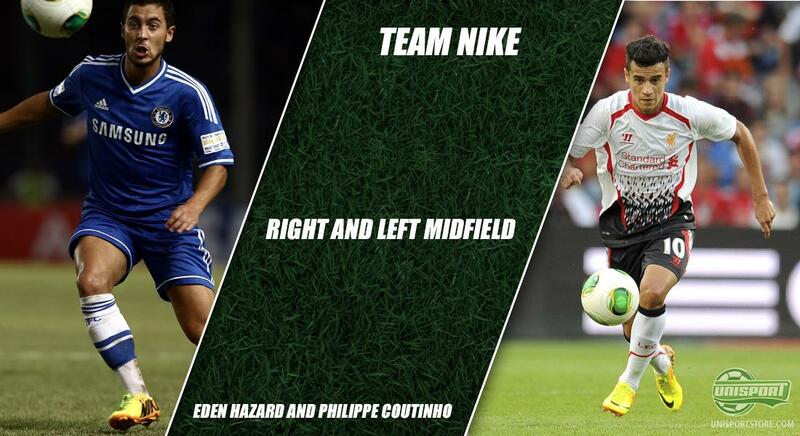 With his pace and brilliant ability to take on his direct opposition he is a no-brainer. A midfield needs drive, energy, sublime technique and unpredictability. Therefore we have on the one wing placed Eden Hazard, who with scary technical ability can skin any opponent and wearing his Nike Mercurial Vapor IX he has dribbled his way straight into our side. We have also found room for the young, enterprising Liverpool talent, Philippe Coutinho, who has plenty of speed and Brazilian samba-skill, which we hope can discombobulate the Adidas defense. Central midfield is the heart of the team, where most battles are won and lost, which is why we needed to be careful in our selection. The super talent Jack Wilshere from Arsenal was our first pick, which a unique drive, he is sure to stress the Adidas defense, while wearing his Nike CTR360 Maestri III. Next to him he finds Yohan Cabaye, who is as controlling, as the boots he is wearing. 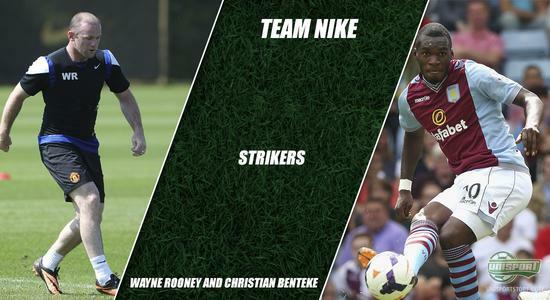 As managers of Team Nike we expect to see plenty of goals and therefore we have picked two of the Premier Leagues sharpest shooters. Manchester United striker Wayne Rooney has a powerful strike and sublime vision and wearing his Nike Hypervenom Phantom, we expect to the the unpredictable element of his game. No less when Rooney will be teaming up with the incredibly powerful striker Christian Benteke from Aston Villa. There should be plenty of room for the Nike team to operate, when Team Adidas are busy dealing with the human tank, Benteke. On Team Nike we expect to see full blooded commitment, but should anyone have an off day, we have a sharp bench, ready to jump in and take over. 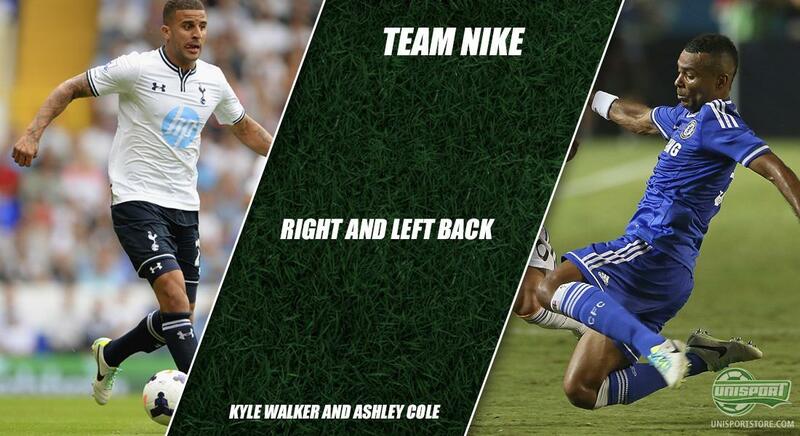 In defense we have Ashley Williams, who can quickly lace up a pair of Nike CTR360 Maestri III and hop in. A quick substitution would also see Ramires enter the fray and control the ball with his Nike Tiempo Legend IV. 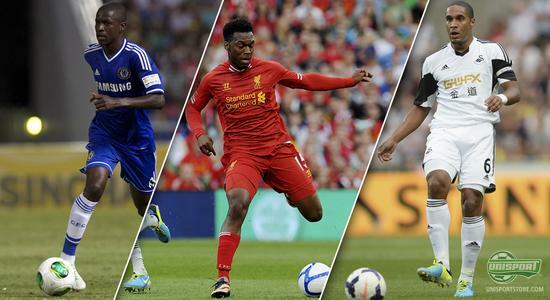 Should the attack be failing, the Liverpool striker Daniel Sturridge is ready for action, if you give him the chance. 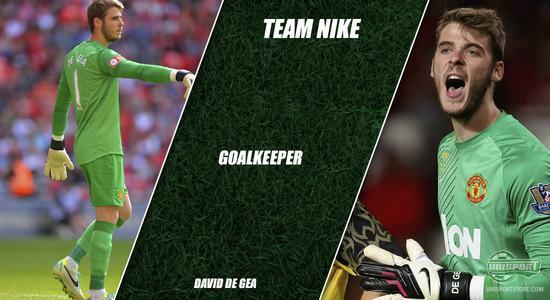 It is undoubtedly a strong Nike-team we have set-up. Things will however not be easy for them, as we have put together a side, who can rival them player for player. We have found the biggest EPL stars wearing the German brands boots and this has resulted in a frighteningly strong side, capable of besting anyone. The keeper was probably the easiest spot to choose. 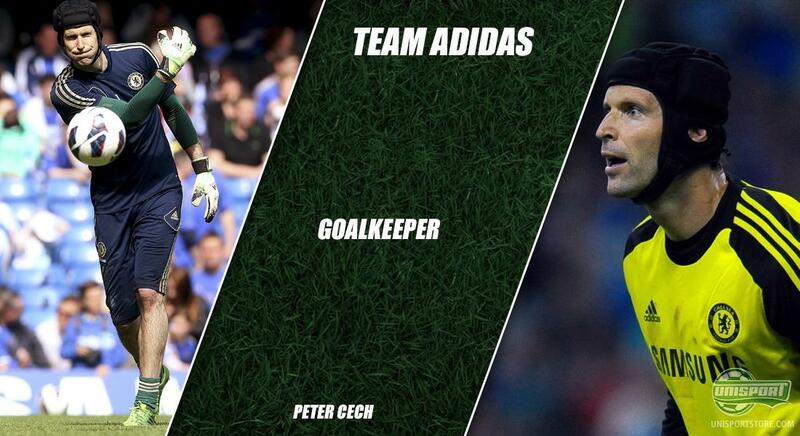 Petr Cech has all the qualities you look for in a goalkeeper and if you ever wanted a man as your last line of defense, chances are Petr Cech is your guy. He is commanding in the area, good in one on ones and has extreme agility, especially considering his large frame. 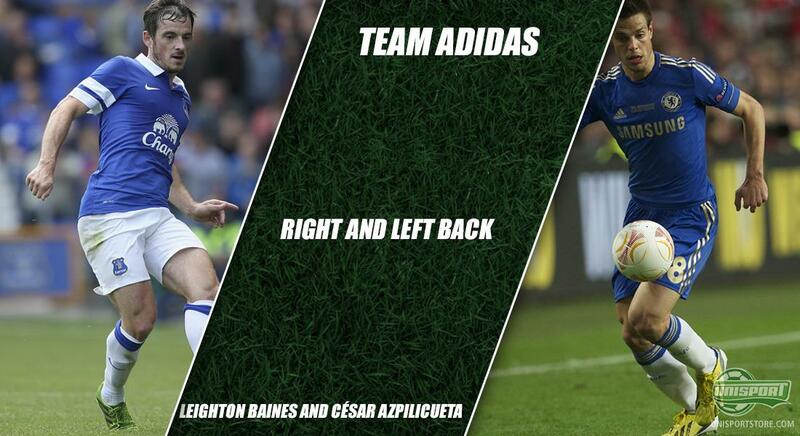 This is why he is our Team Adidas player, wearing Adidas Predator LZ II. 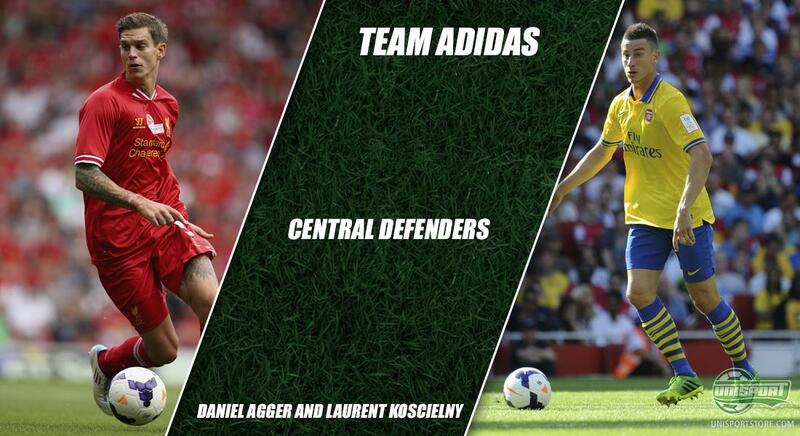 Defense for Team Adidas is made up of Daniel Agger, also known as The Dagger. He will be blocking shots left, right and centre, while wearing his second generation of Adidas F50 Adizero. If he can manage to not get injured, he will a commanding presence in the center of defense. He is joined by Laurent Koscielny, who after an impressive season last year, has pushed Thomas Vermaleen to the bench at Arsenal and this has earned him a spot on our Team Adidas. Wearing the brand new Adidas Predator LZ II, he hopes to keep Benteke and Rooney at bay. Full-backs these days are not only required to be great defenders, but also attacking forces to be reckoned with. We feel we have found just that in Leighton Baines, who with impressive play wearing the Predator LZ II, has attracted attention from the reigning league champions, Manchester United, who are keen to sign him. Along with him is Chelsea's right-back Cesar Azpilicueta, who not only displays great technical ability, but also solid defending and he does so wearing the Adidas F50 Adizero. Our Adidas midfield is focused on just one thing: attack! There will be plenty of pace, to make sure Team Nike never have a moments peace. Therefore we have gone for two fast and energetic gentlemen. On the one wing we have none other than last seasons Player of the season, Gareth Bale, who is another one of this summers big transfer saga's. 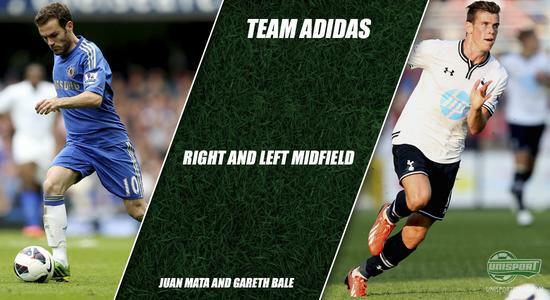 Whether he will be allowed to leave Spurs is uknown, but one thing is certain, he will always be a Team Adidas player. He is joined by the equally talented Juan Mata, who wearing the Adidas Predator LZ II will be teasing defenders with his excellent close control. The center of the park is also with full focus on dynamic and enterprising attacking play. This is why we have gone for a midfield of Spanish flair and English steel. The one spot goes to Liverpool-captain Steven Gerrad, who will be unhinging opposition defenses with his Adidas Predator LZ II. He is joined by the little Spanish maestro Santi Carzola, who will deliver football magic on a regular basis. The classic values of his Adidas Adipure 11Pro are sure to help him, when he finds the gaps in Team Nike's backline. Our Adidas central midfield may be a little attacking, but we are sure they will do their bit to track back and help their team-mates. The crowning jewel of the side is the attackers. 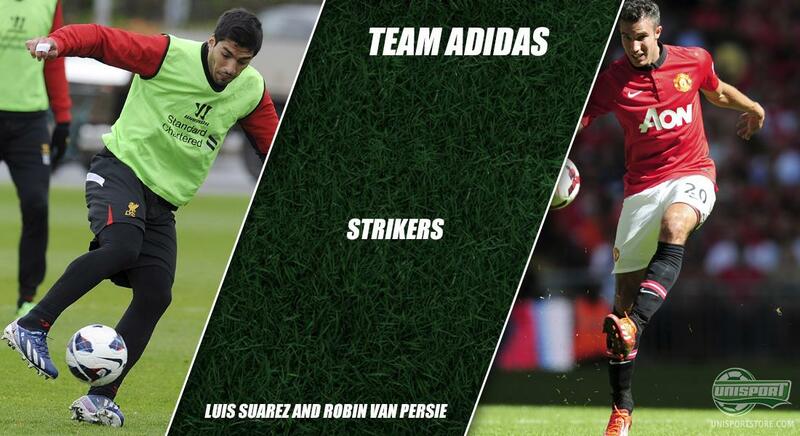 Here we have an explosive duo, with two of Europes very best strikers, who both wear the Adidas F50 Adizero. The one spot goes to the constantly controversial striker Luis Suarez. We expect to see attacking football play, as dangerous as the gnashers in his mouth. Suarez is sure to bang a couple of goals, but should he not do the business, we have Robin van Persie ready to bang in the goals for him. The Flying Dutchman was arguably the first player on our list and we are sure he will hit the back of the net, as many times as he did for United last season, where he won the Golde Boot. On the bench we see three players, who are probably not happy to be there. And we don't blame them, because all three have the qualities to compete on any side. In defense we have Chelsea's Gary Cahill, who is always a sturdy and dependable defender, with a bit of flair in his locker too. In midfield Swansea star Michu is ready to step in any day and do the business. On top of the two top class strikers in our team we also have Fernando Torres, who can always make an impact. How a game between these two sides would end, is hard to say. But we would expect nothing less than world class football play and immense effort, as they fight to become the Premier League's strongest sports brand. And the good thing for us is that we are managers for both sides, so we can't not win. So a big congratulations to us. (Should it end up a draw, it goes to penalties). It is without doubt two strong team, which we have put together here and we are looking forward to following the players in the coming season of the Premier League, which kicks off tomorrow. Which of the two sides do you think would come up on top? Feel free to share your comments in the box down below and do the same on Twitter, or Facebook.